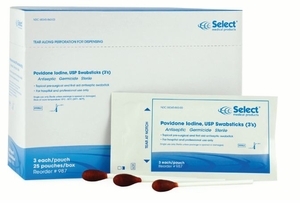 SELECT PVP Swabsticks are each saturated with 10% Povidone Iodine, USP. 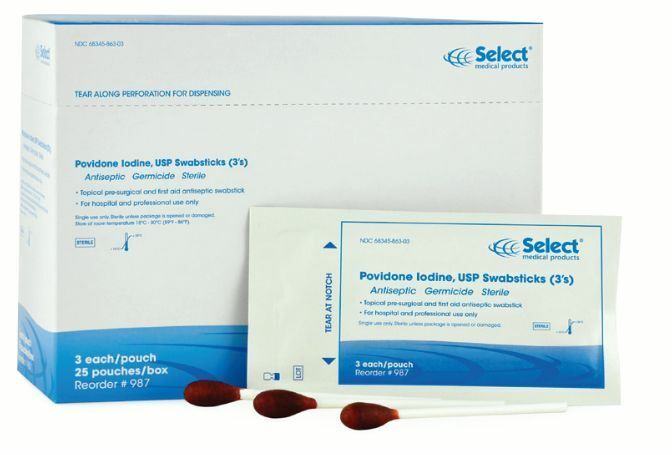 The Povidone Iodine Swabsticks are ideally used as an antiseptic and germicide for preparing the skin prior to surgery or injections. Iodine swabsticks help prevent the risk of skin infections in minor cuts, scrapes, and burns. Each swabstick is 4" long. Sterile. Available in a box of 50 individually sealed swabsticks (# 986) and a box of 75 swabsticks (25 packets of 3. # 987).